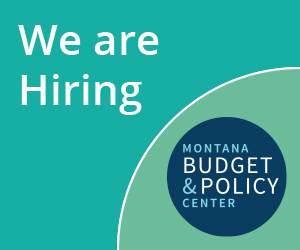 The Montana Budget and Policy Center (MBPC) is pleased to announce that we have been selected to host a State Policy Fellow, and we are looking for a great person to join our team. This fellowship is part of the State Policy Fellowship program, an exciting career opportunity for master’s level students and recent graduates. The Fellowship is a project of the State Priorities Partnership, a national network of independent state policy organizations in 43 states coordinated by the Center on Budget and Policy Priorities (CBPP), one of the nation’s premier policy institutes. Since 2010, CBPP and the State Priorities Partnership have placed Fellows in leading state-based policy organizations across the country. MBPC has a special focus on State-Tribal Policy to promote sound fiscal and budget policy that can help reverse the history of economic injustice that has led many American Indians to unacceptable levels of poverty, unemployment, and poor health. Our work aims to inform policymakers on how state tax and budget choices affect Indian Country, and to increase the involvement of American Indian leaders in state budget advocacy. Montana has been approved for a Fellow and we are actively searching for a qualified individual to enhance our work in this area. It is critical the Montana Fellow be familiar with issues in, and even have close ties to, Indian Country. Eligible candidates also need to have experience working with tribal communities, a strong research background, and excellent written communication skills. Candidates should be self-motivated and have a strong sense humor. The Fellow in Montana will be focused on poverty related issues in Indian Country in Montana. However, there will be some flexibility within that context, as the Fellow’s work will be tied to the broader work of MBPC. Bring diverse perspectives to state policy debates. To expand the voices that speak with authority in state policy debates, the program identifies highly qualified candidates with a track record of working on public policies affecting low-income and diverse communities and policies with implications for racial equity. Eligible candidates must have received a graduate degree within the past two years, or expect to receive a degree before August 1, 2018. Candidates must also have a strong academic record and be eligible to work full-time in the United States for the two-year duration of the program. Please help us by circulating this information to students or other individuals who may be interested in applying. Completed applications must be submitted online by February 12, 2018. For complete program information please visit www.cbpp.org/fellowship. If you have questions, please do not hesitate to contact the national fellowship coordinator mmitchell@cbpp.org or the Montana site lead hcahoon@montanabudget.org.